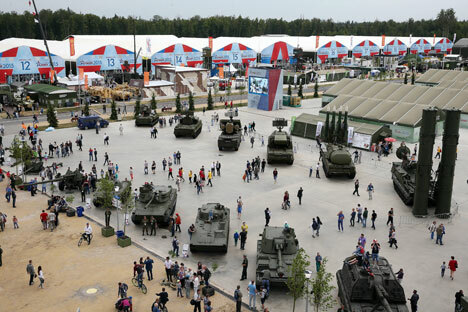 Organizers of the mega military exposition ‘Army-2015’ had two tasks before them; to attract foreign buyers for Russian weapons, and demonstrate Russian military might to the domestic audience for whom military service, in the present wave of patriotic fervour, is becoming as prestigious as it was during the Soviet era. The ‘Army-2015’ Forum held in Kubinka near Moscow from 16 to 19 June nearly eclipsed the Paris air show taking place at Le Bourget in France simultaneously, Russian media reports suggested. It was the first time that Russians saw such a large volume of modern military equipment at one site. The Army-2015 Forum, which the Ministry of Defence plans to hold every year, is not just an event based on the template of an “arms supermarket,” where clients choose weapons and hold preliminary negotiations to procure them. The forum is a place for serious discussion, where experts discuss the most pressing issues about development of the armed forces. The cluster of the Patriot exhibition centre, where the forum was held, will be opened only next year to the general public. It has already been nicknamed the ‘military Disneyland’ because of the roads, bunkers, and shooting range. It says a lot that the centre can rival in scale the Russian Arms Expo in Nizhny Tagil and MAKS (International Aviation and Space Salon) in Zhukovsky, as well as other large international arms expositions. Alongside the huge area for the standing exhibitions, the Patriot centre is equipped with a huge ground to demonstrate military capabilities of the land, water, and aerial technical equipment. All types and kinds of troops, central bodies of military control, manufacturing enterprises, scientific and industrial organizations, and leading educational institutions presented their exhibitions at the forum. Visitors to the expo, who represented 59 countries, were actively interested in the novelties. Many types of weapons were displayed in public for the first time. Among these was the maritime version of the reconnaissance and attack helicopter Ka-52K and the “Arctic” version of the world’s ‘best seller’ helicopter, Mi-8/17 – Mi-8AMTSh. The helicopter has protective armour and suspended weapon can be placed on six hard points: anti-tank guided missiles (ATGM) “Ataka” or “Shturm” and the air to air guided missile system “Igla.” The “arctic” helicopter is functional in low-temperature, limited visibility conditions, including during polar nights. The manually-portable air-defence system (MANPADS) ‘Verba’ was an anticipated novelty at Army 2015. The Russian military, including the naval infantry and paratroopers, will soon acquire this upgraded MANPAD. The main distinguishing feature of the ‘Verba’ from earlier Russian MANPADS (like the legendary Iglas) is the heat-seeking multi-spectral optical homing head (GOS), by which the missile can distinguish targets from the passive thermal spots that are now actively used on all military aircraft and helicopters, including transport ones. Contemporary GOS missiles can even “catch” drones, which have low thermal radiation. According to Valery Kashin, chief designer of the Kolomna Machine-Building Bureau, ‘Verba’ will be exported. The Air Defence forces showcased the mobile radar complex ‘Nebo-M,’ designed for air defence combat missions and anti-aircraft radar support. The complex works through any interference, on many programmatic vision bands, so even the smallest target flying at hypersonic speeds is not hidden from its "all-seeing eye. Forum visitors experienced the system’s effectiveness themselves: when Nebo-M started to scan airspace over Kubinka, many lost their mobile phone connectivity. Technologies for public use also found a place at the military forum. Radio-Electric Technologies (KRET), which is part of the Rostec State Corporation, presented an onboard defence system (ODS) ‘President-S’ at the exhibition. It protects civilian aircraft from surface to air missiles (SAMs) and MANPADS. The President-S automatically detects the launch of a missile and activates the application of passive and active interference in the infrared and radio wavelengths, so the missile’s homing system is disrupted and it strikes a false target. All kinds of dynamic displays, including demonstration of the newest firearms, were the most impressive and spectacular at the Army-2015 Forum. In the land cluster, BTR-MDM ‘Rakushka’ and SAU ‘Sprut’ military vehicles were displayed. Equipped with a 125 mm smoothbore gun and weighing only 18 tons, the SAU ‘Sprut’ can overcome watery obstacles and, with the help of a special multi-domed parachute system, can be parachuted from on-board Il-76 military transport aircraft without special preparation. Around 40 airplanes and helicopters participated in technical demonstrations at the forum. Among them were the Yak-130, Su-30SM, Su-34, Su-35 airplanes and Ansat-U, Ka-226, Mi-8AMTSh, Mi-35, Ka-52, and Mi-28H helicopters, as well as the fifth - generation T-50 fighter.